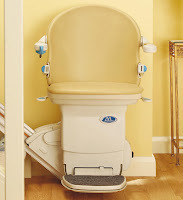 Castle Comfort Stairlifts offers top brand stairlifts, keen prices and fast installs for all those seeking stairlifts in Strathclyde, Glasgow. And all work comes with our no-quibble guarantees and famous customer service satisfaction. London has its boroughs, Paris its arrondissements and Glasgow like New York its districts. As this is a second visit to the city of Glasgow for this blog, some of its many districts will be our focus. This city is huge and is home to more than half a million people. During the Victorian and Edwardian eras, Glasgow was known as ‘the Second City’ of the British Empire. Since then not only has its population grown but much urban refurbishment has taken place and new towns have been built to alleviate some of the early overcrowding of this popular city. The city stretches beyond its centre, its retail and financial districts to what some would refer to as its suburbs. Each one has its own personality, some of them evolving as refurbishment occurs. One thing’s for sure, this vibrant city is never dull. If you’re looking for Glasgow’s bohemian side, then look no further than West End. Here you’ll find cafes, bars, clubs, restaurants and up market hotels. You’ll also find the University of Glasgow and the Glasgow Botanic Gardens in the West End as well as the Scottish Exhibition and Conference Centre. Hillhead is one of several residential areas of West End. It is popular with students and academics as it is close to the university and also with writers and media people. Partick to the west of Hillside was once the residence of the Kings of Strathclyde and the Bishops of Glasgow. Now you are more likely to meet students from the university on the streets. In the East End you’ll find ‘The Barras’ aka Glasgow Barrowland Market as well as Celtic Park home to Glasgow Celtic FC. Originally an industrial area, many of the original tenement buildings still remain as a legacy to these times. Now the Wellpark Brewery responsible for Tennent’s Lager is still one of the biggest local employers. In the East End you’ll also find the Glasgow Necropolis, an old Victorian cemetery, on a hill behind Glasgow Cathedral or High Kirk. At the cemetery’s peak there is a statue of John Knox a Scottish Protestant reformer. South Side, literally south of the River Clyde is a jigsaw of small residential districts, although it does have some notable public buildings like Charles Rennie Mackintosh’s Street School Museum and House for an Art Lover too. It is also home to Hampden Park home to Queens Park FC and the Ibrox Stadium where Glasgow Rangers FC play. One of South Side’s most infamous suburbs is The Gorbals. Industrialisation brought people flooding to the cities where there was work and Glasgow was no exception. The Gorbals area was already overcrowded by the 19th century. By this time work brought immigrants from Italy and Ireland; later Jews from Eastern Europe and Russia also came. At one time, the Gorbals housed the biggest population of Jews in Scotland. As they improved themselves and got educated they moved out of the area. Others weren’t so fortunate. The area became termed as ‘slums’ because of the overcrowding and the poverty. Although the first ‘slums’ were cleared in the 19th century, it was the 1960’s before there was a big push to improve conditions. Unfortunately the older buildings were replaced with concrete towers which didn’t help. There is now a clearance and refurbishment programme in place and the Gorbals is losing its poor reputation. Alan Pinkerton who set up the Pinkerton Detective Agency in the USA came from the Gorbals. Located just 2.5 miles south west of Glasgow’s city centre, Govan has a long history back to at least the 5th/6th centuries. In the 1930’s it became an over-spill district for The Gorbals as slum clearance began in ernest and Govan grew as a working class area retaining some of the Gorbals’ legacy for poverty. Govan was the centre of the Clyde’s ship building industry. Now it is home to BAE Systems Surface Ships who were responsible for building the Royal Nay’s HMS Defender in 2009. Sir Alex Ferguson and Kenny Dalgish both come from the Govan area. Pollock meaning ‘people who live by a pool’ is a large district with a long history. In recent times – 1920’s and 1950’s – the area was developed to house 30,000 from Glasgow’s crowded inner city. It is mainly residential but it’s also where you’ll find Pollock Country Park and Crookston Castel where Mary, Queens of Scots was held. Pollockshaws was originally an industrial area and still has many of the typical sandstone tenement blocks. It is home to both working and middle class families which includes and Asian community. Comedian Frankie Boyle is famously from here. Pollockshields is a conservation area developed by the Stirling-Maxwell family in Victorian times. Many well-known architects had input. Nowadays it is home to an eclectic and ethnic community. The late songwriter Eric Woolfson who created The Alan Parsons Project grew up here. Here there is a cultural mix with affluent suburbs as well as some of the poorest. Possilpark and Hamiltonhill fall into the latter category with high levels of unemployment and social problems. In the more affluent Bearsden, where singer Darius calls home, part of the Roman Antonine Wall runs through the area. Bearsden has many larger town houses and is a desirable place to live in Glasgow. Milngavie next door to Bearsden is also a desirable area with most of its population commuting into central Glasgow for work. It’s a real architectural treasure with a few examples of 19th century stone villas remain as does the railway station which has been well preserved. Victorian houses have been protected in the Tannock conservation area and in the centre of Milngavie, there are Victorian shop and tenement buildings and just a few Arts & Crafts commercial buildings and large houses influenced by that style. Which ever part of Glasgow you hail from Castle Comfort Stair Lifts is here to keep you mobile. We have 15 years in the business and can advise on any angle and you get personal service from us. We can offer you top brands of stairlifts at competitive prices – we even have our own brand. We are very keen to make sure that the 115,000 retired people and other who may have mobility problems get the best and fairest service if they need a stairlift. 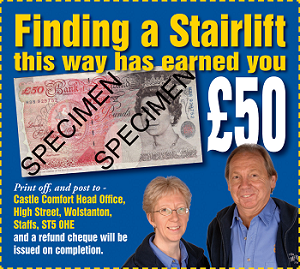 One the decisions have been made, it takes less than half a day to install a stairlift in your home. This means access to all areas, a regained independence and a safer journey up and down those stairs. If you’ll like more information about prices, grants and 0% finance or anything else about stairlifts, please browse our website or give our Glasgow office a call on 0141 278 3929 .